(3BLMedia/theCSRfeed) Columbus, OH (DECEMBER 16, 2009) Michael B. Coleman, Mayor, City of Columbus, joined Coca-Cola Enterprises (NYSE:CCE) today to announce the deployment of heavy-duty hybrid electric delivery trucks to its fleet in Columbus and throughout the state of Ohio. The largest hybrid-electric delivery vehicles in North America, the model GVW 55000 trucks improve fuel consumption by 30 percent, reduce emissions by 30 percent and create less noise and emissions when idling or stopped in traffic. This announcement supports the City’s “Get Green Columbus” initiative, where the community is encouraged to make Ohio’s Capitol the greenest community in which to live, work and raise a family. The City of Columbus strongly believes in leading by example, and earlier this year, Fleet Management’s 100 Best Fleet ranking recognized the city of Columbus as the 17th best fleet operation in the country. 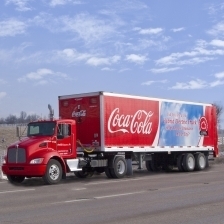 The Coca-Cola Bottling Company of Columbus, a division of CCE, will deliver products throughout the city of Columbus and on The Ohio State University’s campus using hybrid electric tractor trailers (55,000 gross vehicle weight, or GVW). The tractors are the largest hybrid electric truck in North America and are unique to CCE. As part of its commitment to Corporate Responsibility and Sustainability (CRS), CCE will deploy 185 total hybrid electric trucks in 2009, bringing their total number of hybrid electric trucks to 327, the largest such fleet in North America. In addition to the new hybrid electric delivery trucks, the Groves Rd. facility has implemented numerous conservation programs such as in-house recycling and energy-efficient lighting systems. The combined efforts help to capture operational efficiencies, drive innovation and effectiveness, and eliminate waste while simultaneously protecting the environment. CCE is committed to improving overall business performance while meeting the expectations of employees, customers, investors, communities, and other stakeholders in the communities in which it operates. Through the company’s five strategic focus areas of water stewardship, sustainable packaging/recycling, energy conservation/climate change, product portfolio/well-being, and diverse and inclusive culture, Corporate Responsibility and Sustainability is where CCE’s business touches the world and where the world touches CCE’s business. Coca-Cola Enterprises is the world's largest marketer, distributor, and producer of bottle and can liquid nonalcoholic refreshment. CCE sells approximately 80 percent of The Coca-Cola Company's bottle and can volume in North America and is the sole licensed bottler for products of The Coca-Cola Company in Belgium, continental France, Great Britain, Luxembourg, Monaco, and the Netherlands. For more information on CCE’s corporate responsibility and sustainability efforts, please visit www.cokecce.com.